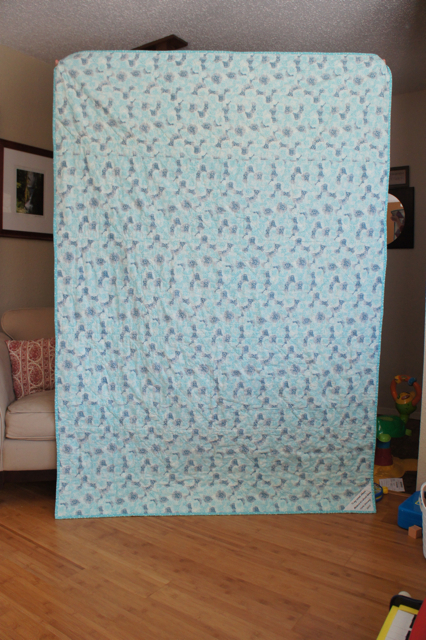 It seems like I’ve made a thousand and one posts (ok, maybe only four) about this particular quilt, but I’ve finally come to the last post about it. Alexis is nine and a half, and has never been the recipient of one of my quilts. They are always gifted (usually baby gifts) to other people’s kids. So this summer I finally swore to her that the next quilt would be hers. Well, the next big quilt anyway (as I snuck in several mini’s and a tree skirt). So she picked some colors and I headed to the LQS for some solids. At the store, somehow a Moda Sugar Pop charm pack snuck in. I thought I was only going to tie this quilt, which is something I’ve never done, but in the end it is partly machine quilted (4 horizontal lines on the ditch between each row of blocks) and hand quilted using the “big stitch” technique and 3 different shades of variegated cotton perle floss. 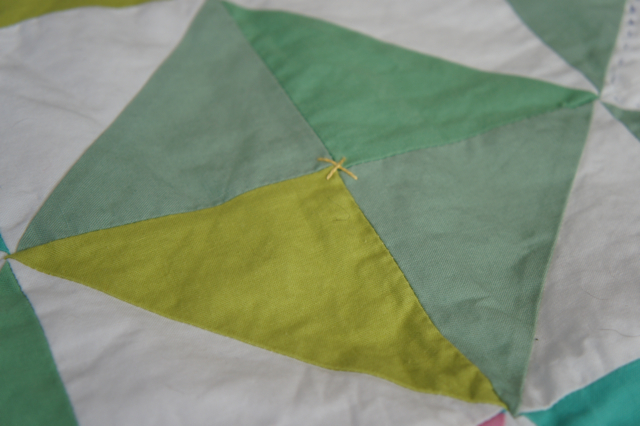 When I started the hand quilting, I thought I would only do every other “row” of white squares, but ended up hating that and didn’t really think it was enough quilting anyway, so all the other white squares were outlined as well. Unfortunately that still didn’t seem adequate as the centers of each windmill block were still completely unquilted, so I added small “x”s to the center of each block. The back is also from the Moda Sugar Pop line. I had considered adding a border to the finished top, but there was just enough of the backing fabric to cover it as is, so no border. Which means this quilt is a little shy of a twin size at about 80 x 60ish. But that’s ok as Alexis’ bed is a loft style bed, and it doesn’t need to hang over the edges when made. The binding is yet another Sugar Pop print. I love the binding. It’s not quite polka dotted, but close enough to make me smile when I see it. And the turquoise is Alexis’ favorite color at the moment. This is also the first time I’ve added a hand embroidered label to a quilt, but I knew that the occasion screamed for it. So I included a simple message to remind us how long she actually waited for this quilt. She loves the label more than you could imagine. Go figure. Originally I had hoped to give it to her for her birthday at the end of the summer, but that didn’t happen, obviously. Around Thanksgiving I decided that come hell or high water, she would get it for Christmas. 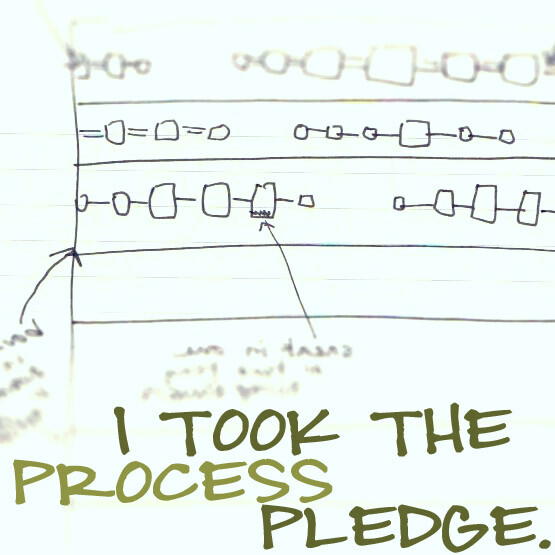 I know she thought it would never get done because the squares would sit untouched for weeks on end. I know she was really surprised when she went up to watch TV in the loft one day and found a basted quilt folded in my spot. I was wondering how I was going to pull off “surprising” her when she already knew what state the quilt was in at any given moment. On the 23rd of December I took the finished quilt down to our room and wrapped it up. I thought for sure she was going to notice it missing from my chair upstairs before we left for my aunt’s the next day. 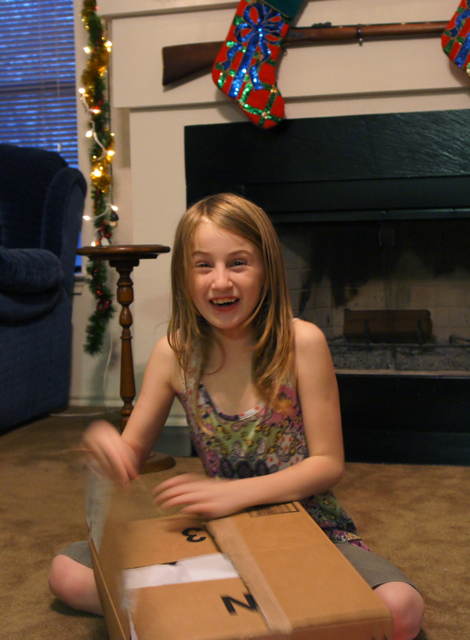 I gave it to her Christmas Eve night, and as you can see, she was so excited when she finally figured out what it was. She was fighting with the tape on the box so hard for so long trying to get it out. I’m so glad it was so well received. I know she will treasure for years to come… even when she hits those teenage years and wants a room entirely shrouded in black. 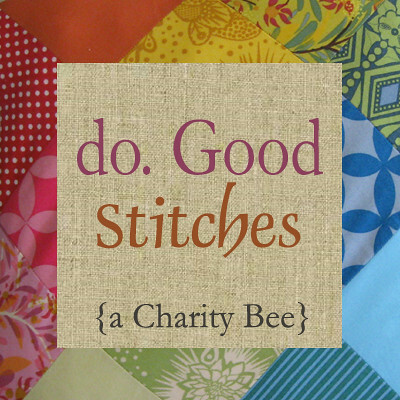 Linking up with Fabric Tuesday at Quilt Story. I love it, especially that the tag made her happy!! Great job-it’s beautiful! It’s beautiful! I remember when she was in your belly and you first started sewing. You’ve come so far and you are so talented! It’s so so lovely. The handmade label is such a great added touch. 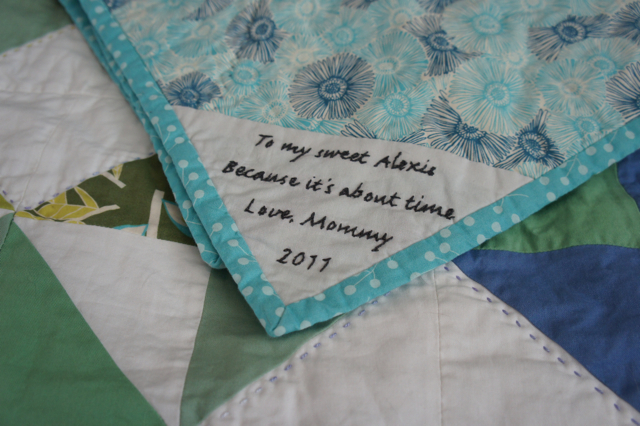 Beautiful quilt, beautiful Alexis, beautiful and talented Mom! What a lovely quilt! 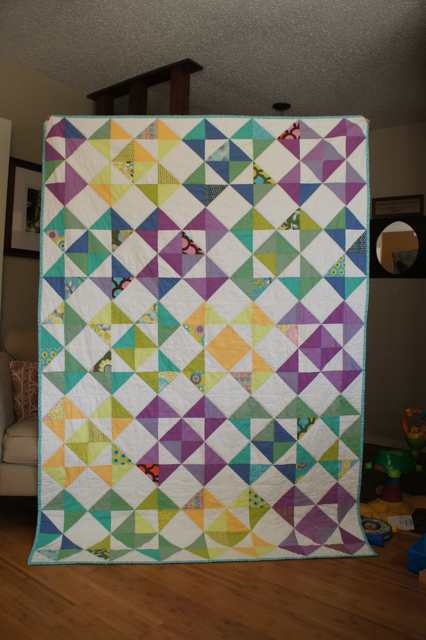 The colours are gorgeous and I think you made the right decision with the quilting. That is a gorgeous quilt. Alexis is a lucky girl! 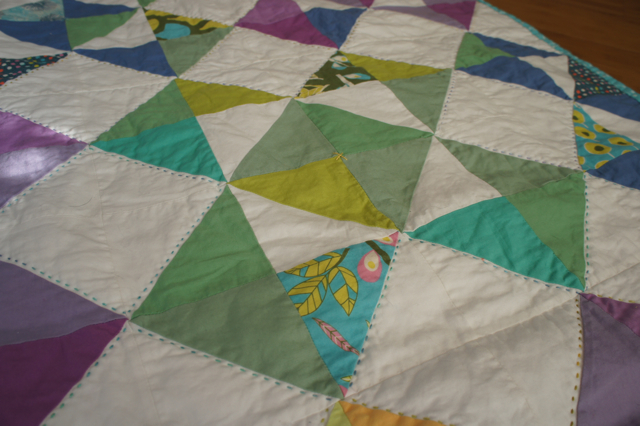 Thanks so much for linking up, your quilt is beautiful. I’m in awe of all that handstitching!!! That quilt is lovely! :-) congrats on pulling off the surprise! Beautiful quilt, I love the colors. And the label was great!